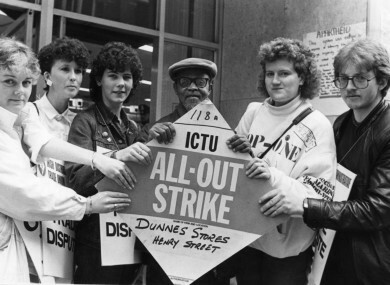 Four Dunnes workers - Sandra Griffen, Alma Bonnie, Karen Gearon and Mary Manning - with two anti-apartheid activists in May 1985. A GROUP OF workers who went on strike at Dunnes Stores in the mid-1980s in protest at the South African government’s apartheid policies are to attend the funeral of Nelson Mandela. Mandate and a number of other trade unions are arranging for the former strikers to travel to South Africa as a tribute to the former president, who died on Thursday. Some of the eleven women involved are travelling to Dublin this evening to sign the book of condolences for Nelson Mandela. “The trade union movement believes it would be a fitting tribute from the Irish trade union movement to send the Dunnes Stores strikes, who took such a brave stance on the issue of apartheid, to the funeral of Mr Mandela in South Africa,” said John Douglas, the general secretary of Mandate. The strike began when 21-year-old Mary Manning, an employee at the Henry Street branch of Dunnes Stores, was suspended after she refused to handle fruit that came from South Africa. Eleven workers went on strike for almost three years between July 1984 and April 1987 over the issue. The government eventually banned South African goods from being sold in Ireland – a ban which remained in place until the end of the apartheid regime. Nelson Mandela met with some of the strikers when he visited Dublin several months after being freed in February 1990, and said that their stand helped keep him going during his imprisonment. In 2008 a plaque to honour the Dunnes Stores strikers was unveiled on Henry Street. It is not yet known how many of the strikers will travel to South Africa as not all of the women live in Ireland anymore. Email “Dunnes Stores strikers to attend Nelson Mandela's funeral”. Feedback on “Dunnes Stores strikers to attend Nelson Mandela's funeral”.